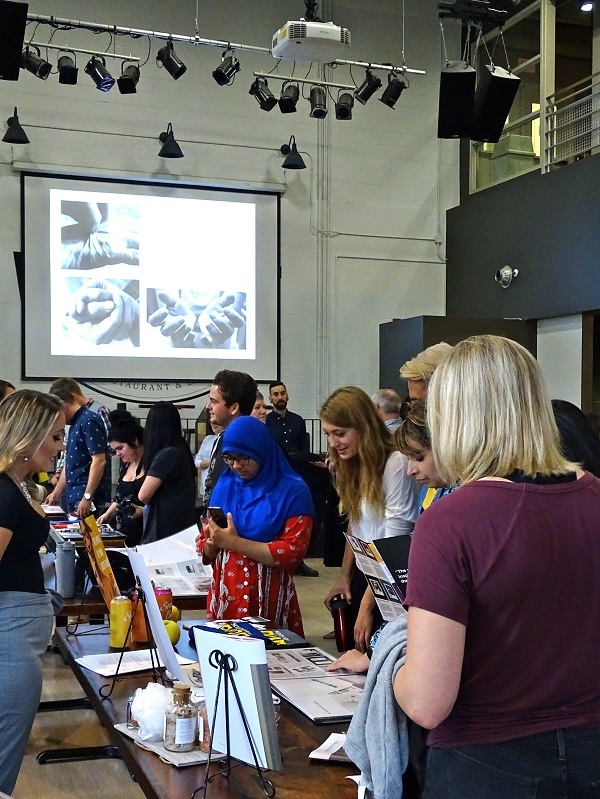 On September 21, Conestoga’s first graduating class from the Bachelor of Design degree program hosted Uncoated—a design showcase held at the Doon campus to celebrate student skills and talent and the first cohort’s successful completion of the program. Conestoga’s first graduating class from the Bachelor of Design degree program hosted Uncoated at the Doon campus on September 21 to celebrate student skills and the first cohort’s successful completion of the program. The portfolios presented were a collection of the best work completed by students during the course of the four-year program and included branding, layout, packaging, illustration, photography and apparel design. Emily Tarrant was among the first group of students to enter the program when it launched in fall 2014. She postponed her post-secondary path after high school and was happy the timing worked in her favour. During Uncoated, she said securing a degree was important to her and by waiting she was able to apply to Conestoga’s Bachelor of Design program when it became available. Tarrant has found the program rewarding. Earlier this year she was honoured with Conestoga’s Co-op Student of the Year award for the work term she completed at Dimplex North America. Two back-to-back co-op work terms between years three and four are included within the program that provide students with opportunities to apply their skills and knowledge as they gain real-world, professional experience. Cailey Gavin presented her thesis project at the show—a body of work that will be applied in the curriculum of the program going forward. The project explored the cognitive processes of creativity; Gavin will develop her research into an educational motion graphics online channel geared towards graphic designers. Also among the presenters were Olivia Dynerowicz and Joschka Sawatzy, who have been recognized by the industry for the design skills and talent they developed in the program. They have each received student awards from Applied Arts magazine, a leading Canadian visual communications publication. "As a faculty we are so proud of this first cohort, as well as how much the program has grown over the past four years,” said program coordinator Ryanne Spies. “Uncoated was an incredible celebration of student successes and a great opportunity for industry professionals to engage with our grads. Congratulations, 2018 graduates!" Conestoga's Bachelor of Design is unique in Ontario for offering an inter-professional perspective that blends graphic design, business and liberal studies courses with co-op opportunities. As a comprehensive design program, students take courses in typography, visual design, colour theory, design studio, drawing and illustration, graphic design history, photography, interactive design, as well as branding, marketing, business management, and writing and presentation skills. The program employs a project-based learning approach that integrates design, research methodologies, project management, and business strategy skills, as well as a variety of issues including accessibility, sustainability, and corporate and social responsibility.